Chemical Storage Tanks for storage, process vessels for most products in a wide variety of applications. Tanks are designed and manufactured to exacting specifications, which allow us to provide the ideal tank for each application. Tanks can be constructed from fiberglass reinforced plastic (FRP), high-density polyethylene (HDPE), polypropylene (PP), dual laminates or various metals. 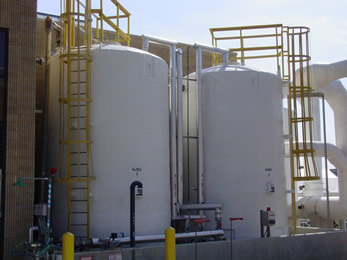 Chemical and process tanks are custom designed for each application and can be made to any size or shape. 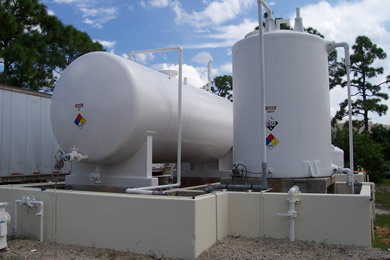 Tanks can be as small as a few gallons to over 200,000 gallon field erected tanks. Each tank is constructed based on the exact specifications for your particular need. Tanks can be rectangular, round, vertical, horizontal, single wall, double wall, and can have flat, conical or dished bottoms with open or closed dome tops.